Costa Rica Food or Surf What’s More Important? You wake up in the morning and can hear waves crashing from your hotel room. What’s the first thing that crosses your mind…What am I going to eat? When am I going to surf? How many days can you live without eating in Costa Rica? How many days can you live without surfing in Costa Rica? How many times a day should you eat so you don’t feel sick? How many times a day should you surf so you don’t feel sick? You can last for at least a week without food in Costa Rica…how long can you last without surfing in Costa Rica? 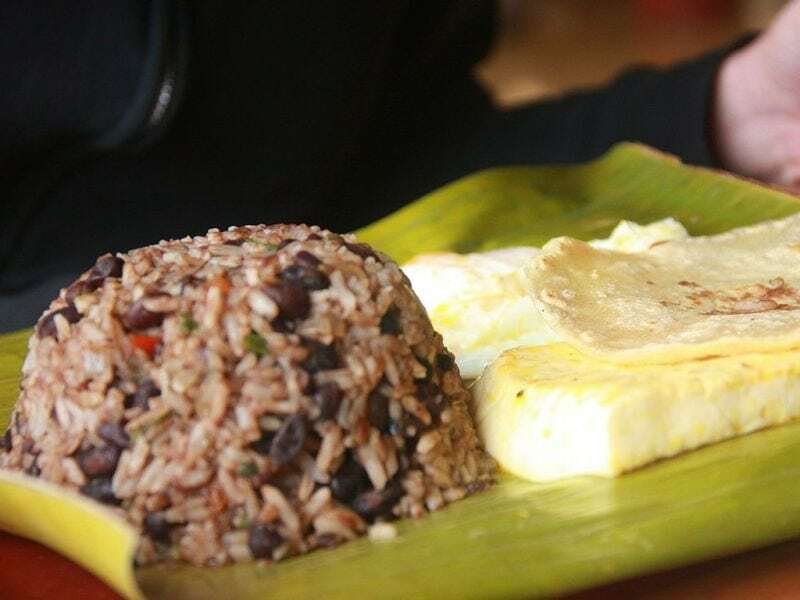 I rest my case: you need Costa Rica food almost as much as you need to surf in Costa Rica. As a surfer traveling to Costa Rica or anywhere, it’s important to understand what’s safe to eat and drink. Luckily for you, Costa Rica food and water are pretty safe, especially for a county in Central America. You won’t hear the same horror stories that come from Mexico. Although you might get sick of eating beans and rice everyday but you won’t get sick because of them. It’s still a good idea to be careful, especially as a surfer. If you are staying at some tiny town near a surf spot in the middle of nowhere, think twice before buying food from a street vender. The farther off you are from big cites or touristy towns the more you should think about the golden rule before you eat something. It doesn’t matter how hungry you are from surfing all day. In Costa Rica sodas are small restaurants that serve inexpensive food. A soda is a great place to grab some food in-between surf sessions. You get a lot for your money and it doesn’t take long. There are many restaurants in Costa Rica. They serve a wide variety of food. Most restaurants cater to tourists and don’t serve what the locals would call “real” Costa Rica food. There are even some U.S. fast food chains in the larger cities. If you want the real experience of Costa Rica food go to a ferias del agricultor (like a farmers market). Usually on Saturday or Sunday mornings the streets will be closed and local farmers and cooks will sell fresh foods and produce. Or if you want the whole Costa Rica experience, go to a bull rodeos or a local football (soccer) game. There you will get the whole Costa Rica experience from food to culture. What is Traditional Costa Rica Food? cabbage and tomato to gallo pinto and it becomes casado, a lunch. Costa Rica’s big meal is lunch. I think the best part about the food in Costa Rica is that it’s different. How often do you drink coconut milk at home? Costa Rica has so many different types of fruit, many you have probably never even heard about. A lot of the drinks in Costa Rica are made from fruit. When your mouth has that salty kind of dryness after surfing all day, a Costa Rica fruit smoothie tastes better than words can even begin to describe. I’m a big fan of trying new things and being open to difference. I think that’s part of what surf travel is all about. Traveling to different parts of the world. Being around people that experience life differently than you. Some of them have nothing and are still happy. Just experiencing difference, and accepting it, that to me is a big part of surfing.